303 are renowned around the world for their 5-star protectants and cleaners, coming highly recommended by companies such Disney World, motorhome market leaders Winnebago and indoor and outdoor fabric experts Sunbrella. 303 has been the premium choice for car enthusiasts, avid boaters and homeowners since 1980, due to the superior cleaning and protection qualities of their products. Their range includes long-time favourites such as Aerospace Protectant, Fabric Guard and Multi-surface cleaner. 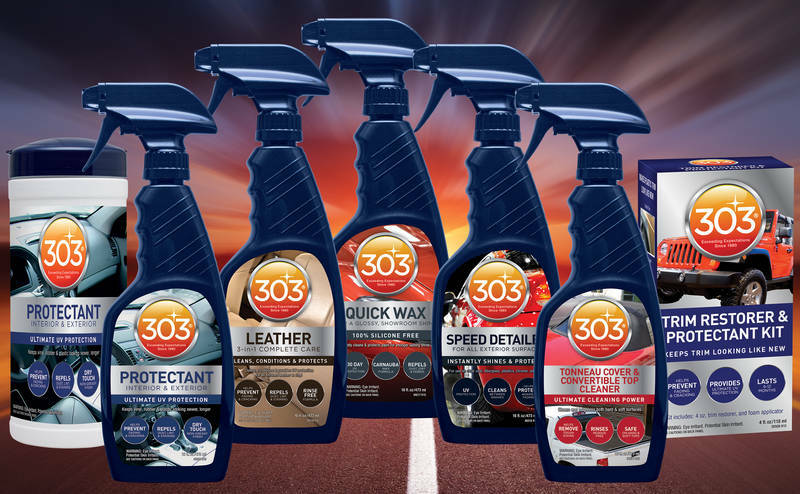 303 continues to innovate, carrying their high quality formulas over to a range of newer automotive products. These products include an Automotive Protectant for interior and exterior vinyl, rubber & plastics, Rubber Seal Protectant, 3-in-1 Leather Complete Care, Speed Detailer, Spray Wax, Tyre Balm & Protectant, Trim Restorer & Protectant, Tonneau Convertible Top Cleaner and more.